MIAMI BEACH, Fla. (AP) — Kyle Busch, Kevin Harvick and Martin Truex Jr. sat on a bench, scrolling through their phones , oblivious to their surroundings and the stakes. Logano is the outcast, statistically and socially, of Sunday’s championship field. He wasn’t picked to advance to the Homestead-Miami Speedway finale but he’s part of the championship party because he used his bumper to move Truex out of his way and win at Martinsville Speedway. But he doesn’t view it that way and thinks this championship might be his to lose. NASCAR shipped the four title contenders off to New York City this week for a full day of promotional activities, then brought them together Thursday for the opening of championship weekend. They had lunch together, filmed a segment on the beach for “The Today Show,” then previewed the title race in a posh South Beach hotel. Asked Thursday if this is the most competitive four-driver finale since the format launched in 2014, it was Harvick who noted it actually isn’t much different than last season when The Big Three raced against Logano teammate Brad Keselowski. “It’s the same four organizations from last year,” Harvick said. “It just depends on if Joey is a better driver than Brad,” Truex added. “They both run into you a lot,” Busch continued. Logano smartly closed the subject: “It’s best if I keep my mouth shut on this one,” he said. 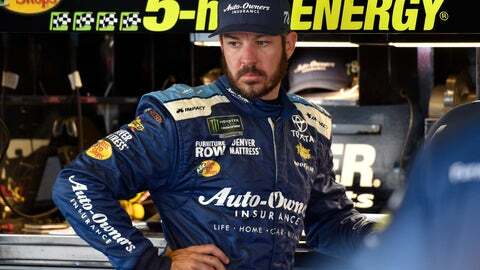 Indeed, the most interesting thing to emerge from NASCAR’s championship preview day was the confusion on how Logano and Truex plan to race each other Sunday. Truex had vowed not to let Logano win the championship after Logano moved him out of the way last month at Martinsville. Forced to spend the better part of two days together as a group, Logano and Truex at one point apparently discussed the situation. Their interpretation of that conversation now differs as Truex claims he’d “absolutely” move Logano out of his way to win the championship. “I have a free pass. He already told me I could. He told me he’s fair game. So here we go,” Truex said.